The formation of the Somali National Movement ( SNM ) was sparked by that general mass discontent with Siad Barre’s Regime. The initiative was made by members of the Somaliland Communities outside the country particularly in the United Kingdom and the Middle East, who were free from the intimidation and repression of the regime. 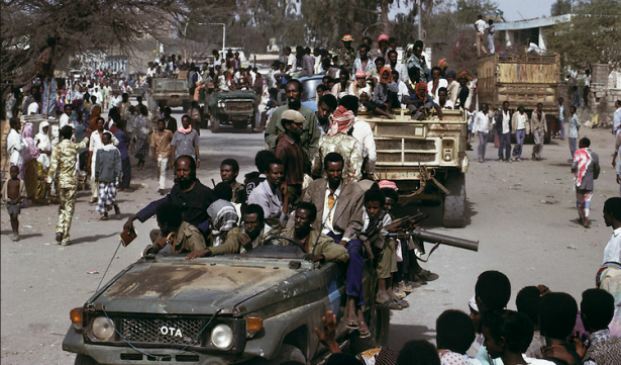 In late 1978 and early 1979 mobilizations intended to upgrade the consciousness of the Somali people started within the country. Committees comprising of elders or community leaders, officers, intellectuals, business people, students, youth and civil servants started underground campaigns in an effort to educate the people against the evils of the Siad Barre’s regime. At this stage in the SNM history Siyad has openly engaged in divisive and sectarian clan politics to discredit and lobby for caesura of that internal mobilization. He has created bandits who were armed by the government and were in the military payroll to destroy total communities to instill harassment and intimidation in those communities. During 1979 to 1980 hundreds of people, mostly women and children were massacred around Gabiley, Wajale, and Allay Baday areas. Colonel Ahmed Dahir ( Dhagax ) " PBOH”, and Colonel Mohamed Kahin Ahmed, and Colonel Adan Saleban "PBOH”. Following those successful attacks the SNM established more then 10 bases in the North, Central and southern border areas within a year. The SNM, therefore, got engaged in highly sophisticated operations of national and international significance. In January 1983 the SNM forces fulfilled a major operation at Mandhera Maximum Security Prison. In the operation the SNM liberated hundreds of political prisoners. They also killed more than 130 soldiers from the Mandhera and Adadley garrisons. In a retaliatory move the regime executed 55 civilians in Adadley, Mandhera, and Go’a area. More then one thousand were detained by the regime’s military and NSS. security forces while fulfilling a secret mission with the SNM internal wing. Colonel Abdillahi Askar who was savagely tortured with candles and cigarettes was to be executed the day following the evening he was rescued. Askar BPOH.) and its supporters ferociously. Those who lived under his jurisdiction were those who were hit hard. They have suffered: Indiscriminate detentions, imprisonment, and massacres. In Mahollin area, south of Gashamo, the regime lost more than 450 soldiers in 1982 and 1984. The area residents captured military documents, communication equipments, small arms and ammunition. jeeps, and armored personnel carrier ( APC ) and three army trucks. It is extremely important to mention here that the SNM has prevented a genocide that was in the making. eliminated from the face of the earth. performance of the Somali army and its inability to keep anything working”. games played by Afweyne Barre to strengthen his position against the MUJAAHIDIIN SNM.